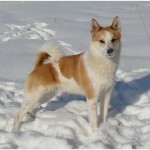 The Norrbottenspets dog is a native of Sweden but is also very popular in the neighbouring country of Finland. 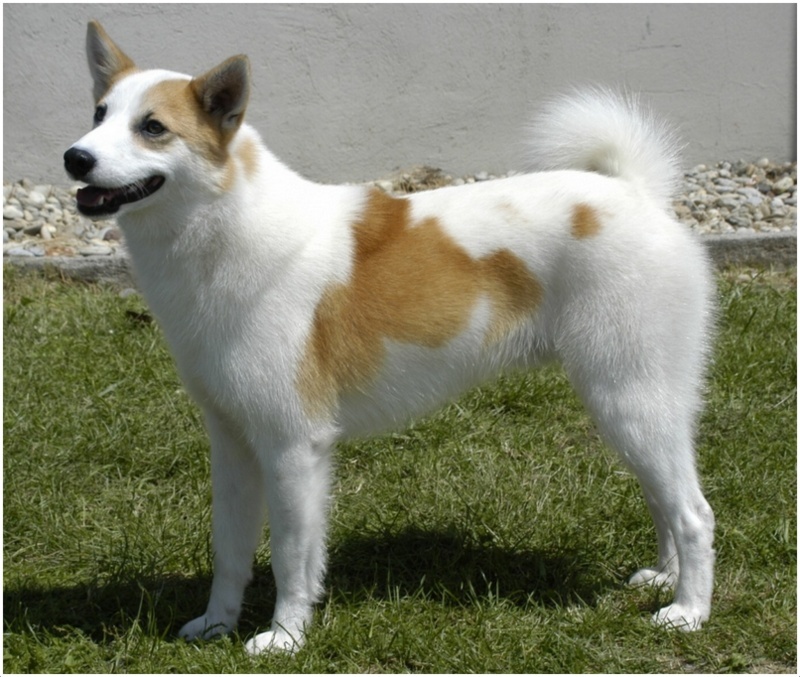 The original purpose for breeding this dog was for helping in farming activities, but due to its intelligence, alertness and agility, it soon turned into a hunting dog and was very popular for hunting wild geese and raccoon. He is known to be a very brave and courageous dog and can even take on bigger animals like bears and moose while hunting. History – Norrbottenspets originated in the region of Sweden and Finland and both countries have been arguing for centuries, each claiming that the breed is native to their country. Unfortunately, this breed of dog almost became extinct after World War I. In fact, it was only because of genuine efforts of some breeders that this species could be saved from extinction. Sweden and Finland officially recognized this breed of dogs in 1967 and 1973 respectively. Health – The dogs of this breed are generally healthy since they are farming/ hunting dogs and have a well-developed immune system. Personality – The Norrbottenspets dogs are one of the friendliest and most loving breeds of dogs. The characteristic of their personality, which they are most known for, are their gentleness and non-aggressive nature. It literally takes a lot of provocation for this dog to retort back. They are very gentle towards children and therefore make great companions for families with small kids. 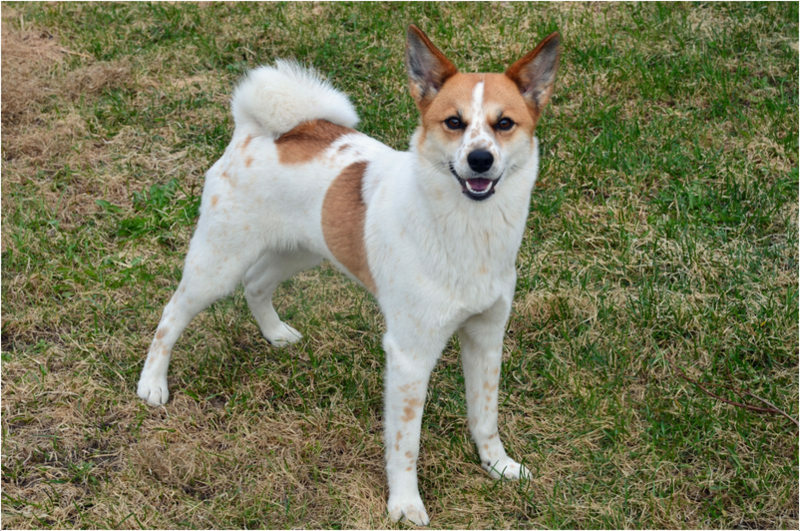 Activity Requirements – Norrbottenspets are basically hunting dogs and therefore they have an ingrained gene which makes them extremely active and high energy dog. To maintain their health, they need a lot of exercise on a daily basis including walks/ jogs as well as dog games. They love to stay outdoors and therefore they are not really apartment-friendly dogs. 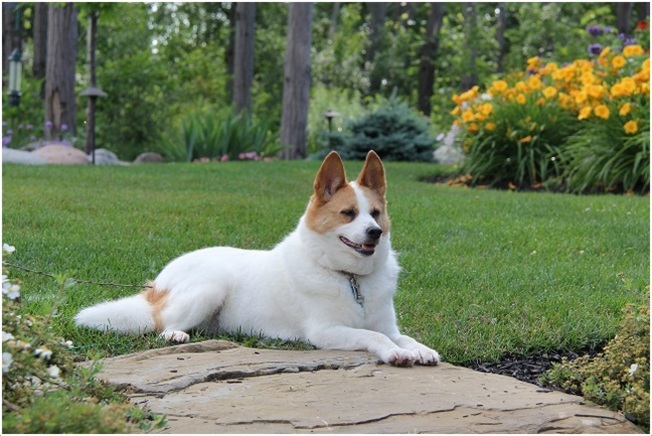 Trainability – It is quite easy to train this dog. However, one thing the trainer must keep in mind is that Norrbottenspets is a gentle dog, and therefore, the training instructions should also be given in a gentle and calm manner. Also, new and innovative training methods are to be used rather than repeating the same routine over and over. Behavioural Traits – Norrbottenspets is a very brave as well as intelligent dog. They are extremely loyal to their family. It is known to be a dog with a positive attitude because of its friendly nature and eagerness to please. 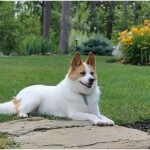 He also makes an excellent guard dog because of his alert nature and tendency to bark continuously to warn the owners. 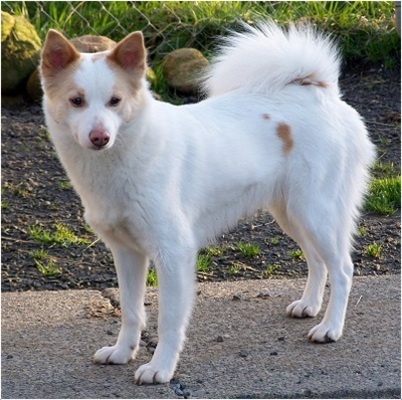 Appearance – The Norrbottenspets typically looks like a small, spitz dog. 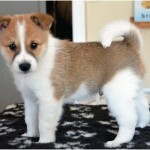 He has a good body structure with strongly built muscles and a short hard coat which is predominantly white and marked with reddish brown and yellow markings. They always give an expression of alertness. Size and Weight – The dog is medium in size but is quite light as compared to the other breeds of dogs. Even while standing at an average height of 40-45 cms, they weigh only 10-15 kgs. 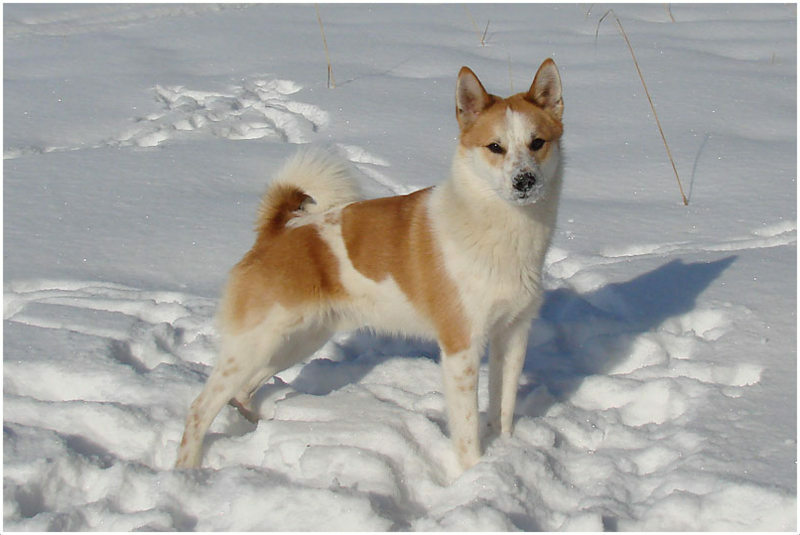 Coat and Colour – The colour of the coat is predominantly white with patches of red, brown or tan markings. Some dogs may also have black patches but that is not generally desirable. The dog also has a double coat which is meant to protect it from extreme weather condition which is common in the region of its origin. It has a smooth soft undercoat, and a short but hard and straight outer coat. Grooming – Norrbotenspets do not require very special grooming. They need an occasional brush down of their coats to get rid of the dead hair. However, they are heavy shedders and shed twice a year. Body Type – The Norrbotenspets has a short, compact and muscular body type. It has a powerfully built head which can be said to resemble that of a fox as is common with other spitz dogs. He has a very symmetrical body and as a result a very smooth gait even while cantering or trotting which makes his movements look almost fluid. He is a non-aggressive dog. He is great with small children as he is very gentle. He is good with other house pets. He is very easy to train because of his positive attitude. He is a heavy shedder. He is one of the most loving dogs by nature. He has a very loud bark which makes him a good alarm dog. He is very fond of outdoor activities like hiking, trekking etc. He prefers outdoors but is also apartment friendly. He has a tremendous amount of stamina. This dog has a tendency to bark excessively even at the silliest of things. This trait comes from it being used as an alarm dog. With proper training, he can be taught not to bark at each and every moving thing. 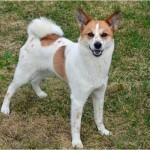 This breed of dog requires very little attention from the owners as far as grooming or health problems are concerned. However, this dog has very high levels of energy and therefore requires a good amount of daily exercise. It has proved to be one of the best companion dogs for families because of its gentle and non-aggressive nature. A diet of high quality dry food is recommended for this dog. The actual amount of food given daily depends on how much activity the dog is getting. If it used for hunting, the diet should be higher. Full name of this dog is Norrbottenspets. 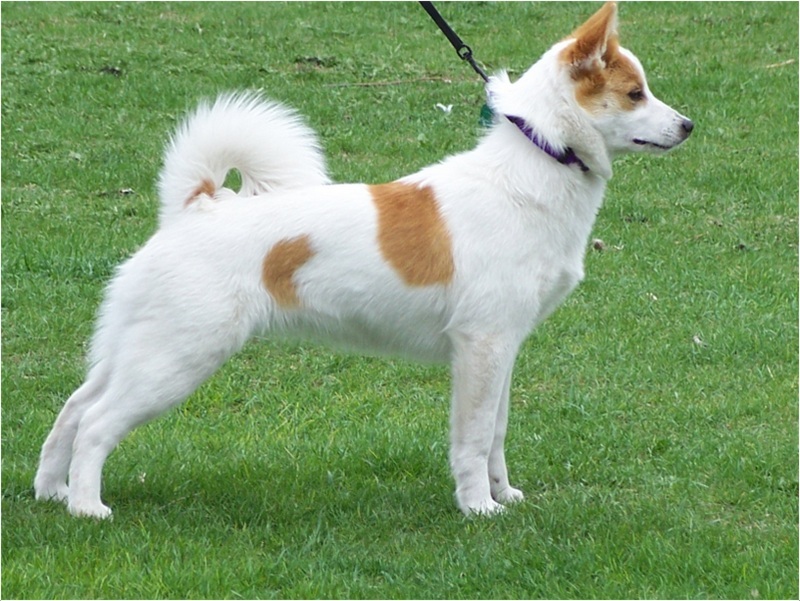 Other names include Nordic Spitz, Norbottenspitz and Pohjanpystykorva. Its country of origin is Sweden. 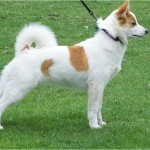 It belongs to the Spitz breed of dogs. 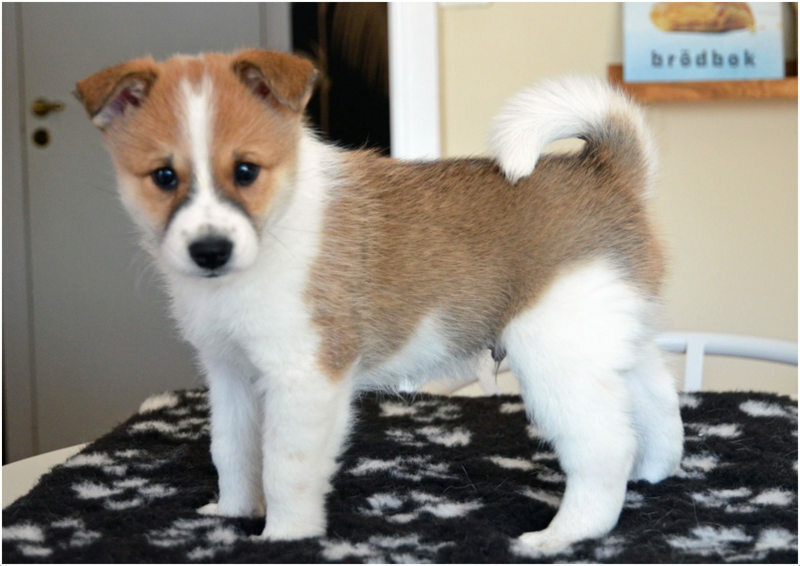 This breed’s average life span is about 15-16 years. The ideal height of a male dog is 45 cms while that of a female dog is 42 cms. A male dog weighs roughly 11-15 kgs while a female weighs 8-12 kgs. 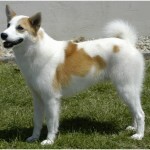 Normally this dog comes in a predominantly white colour which has reddish brown or yellow markings. The dog has a high energy level and requires lots of exercise on a daily basis. This is an extremely non-aggressive breed of dogs and does not retort even if teased by small children.